Great for Cleaning Floral Paint and Glue from your Hands! I work a lot with a variety of glues: Oasis cold adhesive glue, Oasis hot pan glue, hot glue, spray glue as well as a variety of floral paints and tints. And they all leave a mess on your hands, under your fingernails and on your work tables. Over the years of working in the floral industry I have seen and used a variety of different items to clean these items from your hands, but the one product that I have found that works the best for me is WD-40. 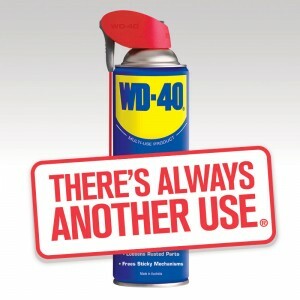 Yes, you heard it right…WD-40. I just spray some of the WD-40 directly on my hands and massage the oil into my hands for a few seconds and then remove with a paper towel. The WD-40 makes the glue roll off of my hands. It also works the same on my work table. I never like to recommend any products that uses alcohol or that are abrasive cleaners, but WD-40 not only removes the glue, but leaves my hands feeling moisturized. So, while I will not recommend this product for you, I will say that it works great for me! I love your designs. Thank you for teaching me to make a,bow. Glad you enjoy the videos Patty…..keep an eye out for my emails…lots of other really cool stuff coming your way!